"Pros are the facilities in the hotel (very clean karaoke roo..."
Have a question for Daemyung Resort Geoje? 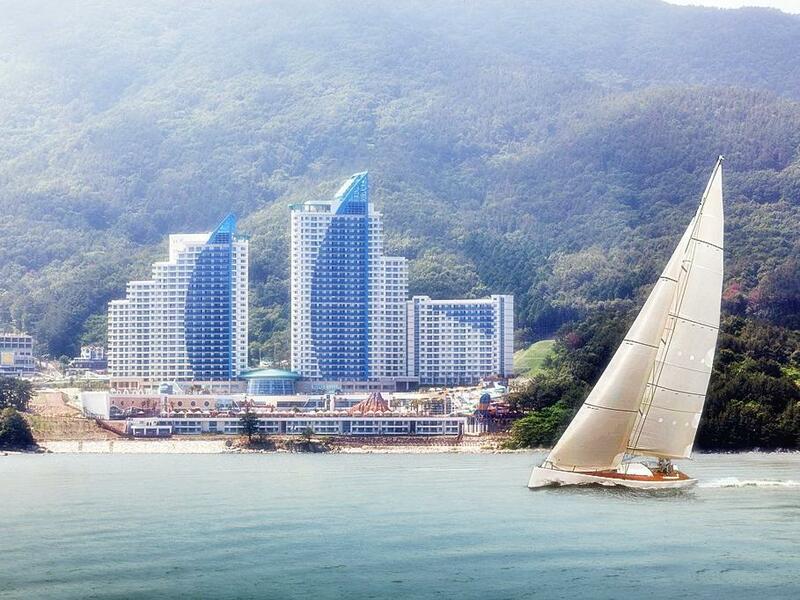 Conveniently located in Geoje-si, Daemyung Resort Geoje is a great base from which to explore this vibrant city. From here, guests can enjoy easy access to all that the lively city has to offer. With its convenient location, the hotel offers easy access to the city's must-see destinations. Daemyung Resort Geoje offers impeccable service and all the essential amenities to invigorate travelers. Free Wi-Fi in all rooms, laundromat, 24-hour front desk, Wi-Fi in public areas, car park are just a few of the facilities that set Daemyung Resort Geoje apart from other hotels in the city. Experience high quality room facilities during your stay here. Some rooms include television LCD/plasma screen, clothes rack, towels, closet, internet access – wireless (complimentary), provided to help guests recharge after a long day. The hotel offers an excellent variety of recreational facilities, including boats, water park, snorkeling, private beach, sauna. Discover an engaging blend of professional service and a wide array of features at Daemyung Resort Geoje. I spent only one night here but really enjoyed the magnificent view of ocean and new and neat facility. I heard this is partly used as time share accommodation, that is why they do not have big towels nor room slippers. I tried their Italian restaurant where I enjoyed a pretty high level taste and big portion of food. Only thing I did not like was the fridge. From some reason it smelled like garlic and fishy.... Maybe someone kept some kimchee in it?? Well it is Korea and I have to understand kimchee is everywhere. Loved our stay. Great location, great amenities including a water theme park/pool as part of the hotel. Would return here again and again. It is the most high end hotel at the island but well worth the money. Great hotel for couples, families with young or older children. 거제도를 찾았을때 묵기에 아주 좋은 호텔입니다. 산토리니 같은 느낌도 주고, 반짝거리는 바다가 보이는 뷰도 아주 좋습니다. 실내 워터파크를 이용할려고 했는데 공사중이라 아이들과 놀지 못해 너무 아쉬웠다. 하지만 편의시설이 잘되어 있어 이것 저것 요리해 먹을 수 있어 좋았다. 가족여행 숙소로는 별로 인거 같네요. 새로지어 깨끗하고 취사형은 취사도구가 다 구비되어 편리했어요. 일층에 로비에 스타벅스와 베스킨라빈스가 있어 어른들은 커피마시고 아이는 아이스크림을 같이 먹을 수 있어서 좋았어요. 다만 층간소음이 심해 새벽까지 씨끄러워 잠들지 못했네요..
룸, 뷰 모두 훌륭했습니다 지하에 마트, 오락실 등 부대시설도 많고.. 장내 레스토랑도 괜찮습니다 다만 3시30분경 체크인하려있는데 연휴라그런지 청소가안되어 1시간가량 기다리고 입실했네요 이것외에 가족끼리 즐기기엔 좋은 리조트입니다. 요트투어도 색다른 경험이었습니다. 태풍이 있었는데도.... 실내 수영장이 잘 되어 있어 잘 쉬고 놀다 왔습니다. 3시30분 이후에 갔는데 방청소가 덜 끝나서 방에 짐만 놔두고 나와야 했네요. 이런거 설명해주는 프론트 직원들은 매우 불친절했고 방이 준비가 덜 됐으니 어쩔수 없다는 식이었네요. 예약한 고객은 그 시간에 체크인이라서 온건데 말이죠. 대명리조트 내에 위치한 식당이나 슈퍼마켓 탁구장 그 어디에서도 웃는 직원을 찾아볼수가 없었습니다. 돈이 아까운 서비스 수준 이었습니다. 이불에 머리 카락 나옴. 신경 쓰시길.